Now that Google+ is available, you know you want to grab yourself a profile page! It may not replace Facebook, but Google+ is here to stay, and if you have a business, blog, website or just like to get in on the cutting edge - grab an invite and start your Google+ profile! Why is this important to businesses? Once these pages/profiles arrive they will probably operate in a way that’s pretty similar to Facebook Pages, but with some Google SEO benefits. They will be indexed, “followable” and individual updates or posts can be +1′d — much or all of which will be fed back into search results and rankings. But STOP! Google is not allowing business pages right now. Don't think you can cheat the system and they won't know. If you try to make a profile page using your business name, you are likely to have your account suspended - maybe not today, maybe not tomorrow. But do you really want to risk all your hard work setting it up? "how do you help your business on Google Plus without breaking the rules and risking account deletion? The key is you. You, as an individual are a marketing spokesperson for your brand. If you use Google Plus wisely you can build a reputation as an expert in your field, you can build a loyal following which in turn will turn into business leads and happy customers." 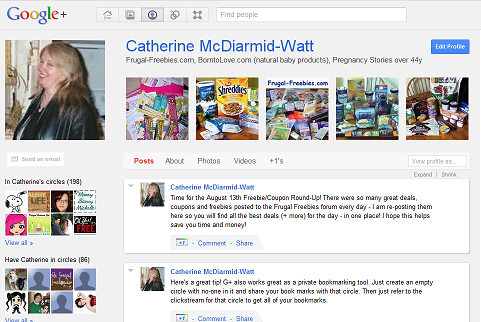 So start out right - using your own name, and use your personal Google+ profile to promote yourself and your business. But now that you are on the inside, how will you make yourself stand out? 1. Profile Photo - Add a real picture of you, not your company logo. Let your customers and fans know who you are. An authentic, warm head-shot is worth so much, in fact it’s essential for building an instant connection with your potential customers. Note - We will use your company logo a bit later. Use a company logo, and you still risk having your profile shut down by Google. They want to be sure you are a real person and they are being pretty strict about it. Several sites had their business-related profiles shut down over the past few days! ☑ Since we are promoting ourselves, set this to "Anyone on the web" can see it. 2. Tagline - This is the line under your name - your real name. The very first words should be your website address (leave off the http://www - it's not clickable). As you can see, mine is Frugal-Freebies.com. Then anything else you want to say about yourself and/or your business after that. Make that 100 characters work for you! Even if visitors don't go to your About page - they now know where to find your website. 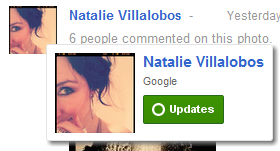 If they have been looking for you on Google+, they now know for sure it's you! ☑ Set to "Anyone on the web" can see it. 3. Employment - put in your website URL first (leave off the http://www - it's not clickable), and include a description of your business. Be sure to check the ☑ Current Box. ☚ If not, it will look like this - pretty standard and boring! If you don't fill out the Employment box - when someone hovers over your photo, all they see is a bigger version of your photo and your name - plus possibly a one-liner of who you are. But if you add more info about yourself and/or your business to your Employment line - now you will really stand out from the crowd! 4. Scrapbook - This is where you can add your business logo, and any appropriate photos from your business. It looks best if you add five photos - you can even make it into a banner. If you want to get really creative and memorable, you could Pimp your Photos! This is a good place to give people a feel for what your business does, so make it exciting! 5. About Page - This is where you can shine! Talk about yourself, talk about your business, talk about your education (if applicable). Fill it out as completely as possible, and add in any videos (under the Video Tab) you have made about your business or your product(s). Brag about your accomplishments - and include all your links! 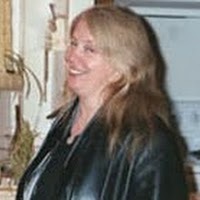 Links to your website, to your Twitter page, to your Facebook Fan page and any other place they can find you on the web! Name your links, so people know what they are clicking on. Not just Facebook - the icon tells them that, but something like: Frugal Freebies Fan Page. Use the editor to bold, italics, underline, make listed items and more. Make your About page easy to read. • On Google, the title comes from your Google Plus Profile name. • The description is from the Introduction field on your About page. 6. Create a "Fan Page" - Create a circle with your business name. Add all your fans and customers. Share your business-related posts with your fans or customers by posting to this circle. Go to Circles ⇨ Select the Circle ⇨ View Stream to view the posts made in the circle. Bookmark this page. This is your new Google+ Fan Page – You can even start a Hangout with your fans/customers! 7. Search Visibility - in your profile settings so you can be found on Google. Now your profile can be found on Google! NOTE - yesterday my Google profile was number 10 in my search - pretty bad when you are looking up your own name! After a few tweaks while I researched and wrote this article - it is number one today! Your Google+ profile now looks much more professional and no matter where or how people come across your profile, whether in someone else's circle or in a Google+ directory, they will also see your company website address - and you will stand out! 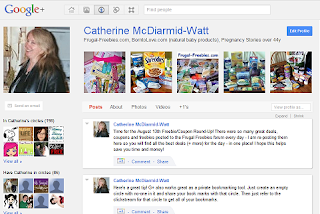 Post publicly occasionally to your Google+ profile - or your profile will look blank and unused! That long Google+ url - plus.google.com/102933646049806078647 is ugly and hard to hand out. Sign up your profile to the Google Plus directory - probably the most popular Google+ directory on the web today. It is featured on CNN, MSNBC, Mashable, and many more! 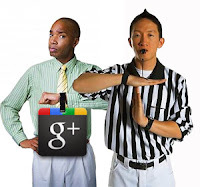 PLUS - whatever links you post on your Google+ profile, will get posted onto this directory - more backlinks for your website! NOTE - If you have a freebie site, feel free to add your Google+ profile to the list! Hi there. I was trying to do this, but I got stuck at Scrapbook. I've uploaded 5 photos, but I can't see how to display them. ?? Thanks!